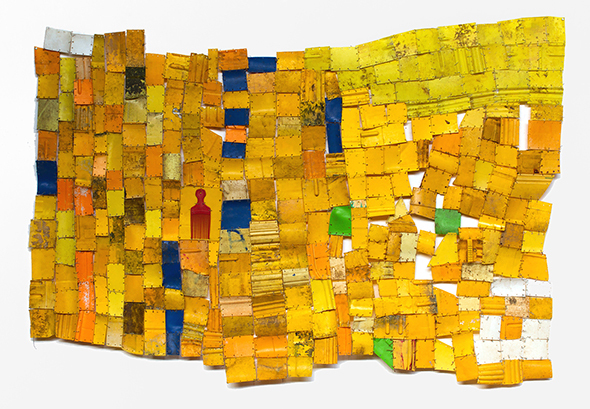 Serge Attukwei Clottey, Beauty and Presence, 2014. Plastic and wires, 75 x 51 inches. Courtesy of the artist. Jane Lombard Gallery is pleased to present Material Connections, a winter group show featuring a select group of artists of varied cultural backgrounds who are redefining the universal medium of textile or nontraditional materials, to explore socio-political issues such as race, gender, historic identity, consumerism and the environment. For Shezad Dawood, textiles form a key element in his multi-disciplinary practice, serving as both stand-alone works and as formal research for later films, paintings, performances, and sculptures. Sourcing from his own diverse heritage of India, Pakistan and Britain, Dawood explores the recurrence of pattern, forms, and meanings across borders, both geopolitical and ideological. Dawood uses vintage textiles fabricated by nomadic Pakistani weavers in the 1970s. By working within and around the textiles’ pre-existing narratives, Dawood examines the dialogues generated by trade, colonization, and globalization, and questions the established binaries between cultures. Kyungah Ham’s ongoing conceptual “Embroidery Project,” has been bridging the conflicted gap between North and South Korea through the idea of secret collaboration with North Korean women artisans. Ham designed a complicated and often dangerous process where intermediaries smuggled her designs to the North Korean textile workers who would fabricate the intricate embroideries. However, these secret works were eventually confiscated, while Ham recreated their South Korean counterparts through machine embroidery. Ham envisions these designs as subtle “propaganda handbills”, inviting the embroiderers to question their meaning and intent. In her most recent “Abstract Weave/Morris Louis” series, Ham combines the sanctioned practice of embroidery with that of forbidden art historical abstraction, additionally interweaving text from news articles and poems into the design. Ham’s clandestine collaborations and her deliberate manipulation of cross-border systems critiques the repressive division of the Korean peninsula in a delicate and intricate gesture of defiance. As a self-described griot—a West African keeper and transmitter of the genealogies of a people, Los Angeles-based textile artist Karen Hampton explores the historical memory of her ancestral heritage through the medium of cloth. Whether in handwoven and aged linens or digitally printed fabrics, the material references the displacement and transience generated by diaspora, creating a continued narrative of identity and internal struggle. Eko Nugroho emerged in the period of upheaval and reform following the reign of President Haji Muhammad Suharto as part of the socially-minded artists of the “2000 Generation.” Nugroho explores the use of manual embroidery within local communities, who continue to utilize foot pedal machines in the face of digital automation, and other traditional techniques such as wayang kulit (shadow puppets) and batik, in order to re-contextualize these traditional methods in the realm of contemporary art. Nugroho combines the influence of Indonesian craft with elements of street art, graffiti, and comics, working in mediums ranging from drawing to installation to performance, generating a subversive mix of tradition and pop.